Igloo Products Corp. (Igloo or the Company) received the Commanders Medal Award from the Veterans of Foreign Wars of the United States, Floyd E. Breedlove, Post 9182 (VFW Post 9182) in a small ceremony held at the Company’s Katy, Texas headquarters on Friday, May 23rd. Igloo Chairman and CEO Gary Kiedaisch accepted the award on behalf of the Company from Post Commander Gary Drahos. VFW Post 9182 Commander Gary Drahos presents Igloo Chairman and CEO Gary Kiedaisch with the Commanders Medal Award. As a Veteran myself and a personal supporter of the VFW, I am very honored to accept the Commanders Medal Award on behalf of Igloo, and I look forward to Igloo’s continued relationship with such an excellent organization. Igloo Products Corp. (Igloo or the Company), the number one cooler manufacturer worldwide, received the Commanders Medal Award from the Veterans of Foreign Wars of the United States, Floyd E. Breedlove, Post 9182 (VFW Post 9182) in a small ceremony held at the Company’s Katy, Texas headquarters on Friday, May 23rd. Igloo Chairman and CEO Gary Kiedaisch accepted the award on behalf of the Company from Post Commander Gary Drahos. 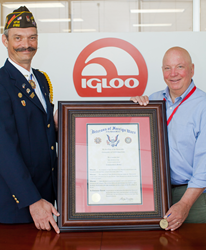 Igloo is the first company to receive the Commanders Medal—the highest honor awarded by VFW Post 9182—awarded in recognition of superior contributions to the VFW and demonstration of the utmost respect towards all Veterans. VFW Post 9182 located in Katy, Texas is the only Post to hand out this honor, which was first designated in 2013. “As a Veteran myself and a personal supporter of the VFW, I am very honored to accept the Commanders Medal Award on behalf of Igloo, and I look forward to Igloo’s continued relationship with such an excellent organization,” said Kiedaisch. Located in Katy, Texas, 30 miles west of downtown Houston. Post 9182 is named for Floyd E. Breedlove, a B-17 pilot who was the first Katy resident to perish in World War II when he was shot down over Europe in 1944. The Post has proudly served Veterans and the Katy Community since its formation in 1947. Meetings occur on the first Monday of the month at 7:30PM. For more information, visit http://www.vfw9182.com.